It is the most common disease of the nails and constitutes about a half of all nail abnormalities.This condition may affect toenails or fingernails, but toenail infections are particularly common. The prevalence of onychomycosis is about 6-8% in the adult population. Distal subungual onychomycosis is the most common form of tinea unguium, and is usually caused by Trichophyton rubrum, which invades the nail bed and the underside of the nail plate. White superficial onychomycosis (WSO) is caused by fungal invasion of the superficial layers of the nail plate to form "white islands" on the plate. It accounts for only 10 percent of onychomycosis cases. In some cases, WSO is a misdiagnosis of "keratin granulations" which are not a fungus, but a reaction to nail polish that can cause the nails to have a chalky white appearance. A laboratory test should be performed to confirm. 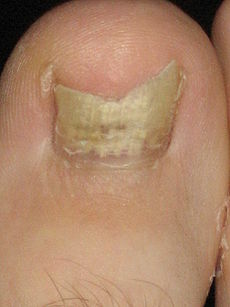 Treatment of onychomycosis is challenging because the infection is embedded within the nail and is difficult to reach. As a result, full removal of symptoms is very slow and may take a year or more. Most treatments are either systemic antifungal medications, such as terbinafine and itraconazole, or topical, such as nail paints containing ciclopirox or amorolfine. There is also evidence for combining systemic and topical treatments. As with many diseases, there are also some scientifically unverified folk or alternative medicine remedies. Australian tea tree oil has been tested, but there is insufficient information to make recommendations for its use for onychomycosis. Grapefruit seed extract as a natural antimicrobial is not demonstrated. Its effectiveness is scientifically unverified. Multiple studies indicate the universal antimicrobial activity is due to contamination with synthetic preservatives that were unlikely to be made from the seeds of the grapefruit. Snakeroot leaf extract has, in studies, shown ability to treat superficial onychomycosis, although the results show it is less effective, and equal to conventional drugs ciclopirox and ketaconazole, respectively. If you feel you have a fungal infection in your toe/s, please feel free to contact me to arrange an appointment to discuss potential treatments.